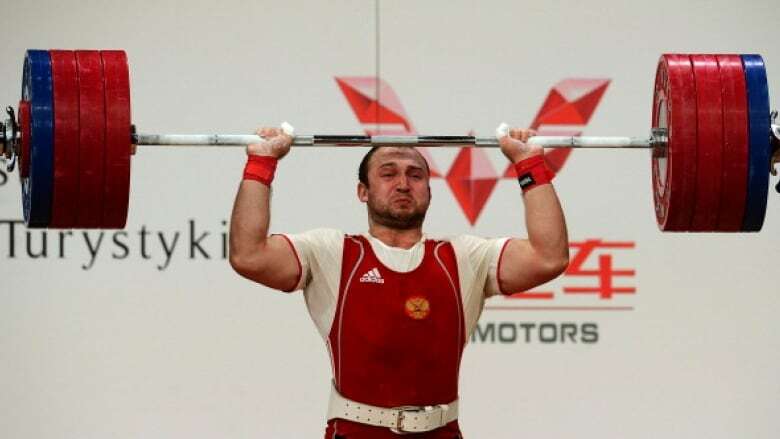 The International Weightlifting Federation says 11 more weightlifters, including six medallists and four Russians, have tested positive in retests of samples from the 2012 London Olympics. Eleven weightlifters, including three Russian medallists, have tested positive for banned drugs in the latest retests of samples from the 2012 London Olympics, the International Weightlifting Federation said Wednesday. The IWF said in a statement that all 11 athletes, six of whom were medallists, had been provisionally suspended until their cases are closed. The four Russians listed all tested positive for the anabolic steroid dehydrochlormethyltestosterone, while Alexandr Ivanov also tested positive for the hormone modulator tamoxifen. The IOC stores Olympic doping samples for 10 years, allowing them to be reopened and reanalyzed when improved testing methods become available. So far, 31 of the 98 doping positives discovered in the retests of samples from the 2008 Beijing Games and the 2012 London Olympics were weightlifters. So far, weightlifters have produced a total of 31 positives in doping retests carried out on samples taken at the 2008 Games in Beijing and the London Games.